Beyond television deals, multibillion-dollar businesses like betting and Fantasy Football depend on the smooth functioning of the NFL. The recent NFL referee lockout turned Sunday games into chaotic affairs, and threatened to upend a financial juggernaut. 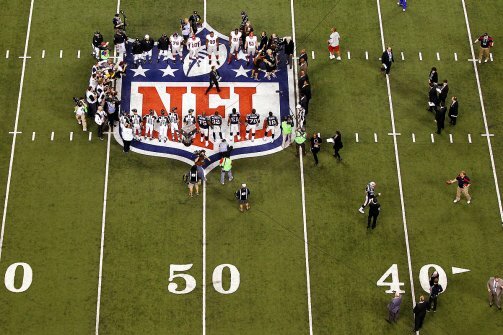 The NFL is a $9.5 billion annual business , after all. Analysts questioned whether fans would tune in to watch endless, poorly officiated messes. But the capricious calls also wreaked havoc on corollary businesses that depend on the smooth functioning of the NFL, like sports betting and Fantasy Football. Both are huge behind-the-scenes money making industries that are driven by fans, responsible for increased game viewership and largely unheralded by the NFL. Call it the shadow football economy. When it comes to gambling, football is by far the most popular sport to bet on. “It’s one of those vice industries like liquor and tobacco. So as a result, lots of humans like doing it,” said Greg Finn, managing director at WagerMinds, a sports betting and handicapping website. According to the Nevada Gaming Commission, in 2011$3.2 billion was wagered in sports bets in the state’s casinos. Of that amount, $1.34 billion or 41 percent was handled just for football. Outside of Nevada the numbers are much bigger. The National Gambling Impact Study Commission estimates that $380 billion is wagered a year on football through offshore accounts and illegal betting. Gambling is a shadow industry that operates independently of the NFL but relies on football games to bankroll casinos and its gamblers. In turn, the NFL benefits from the intense fan interest that gambling helps to generate. Many fans have far more riding on this weekend’s game than regional pride. “The NFL knows a meaningful part of their fan base is interested because they can bet on the games. And if they can’t they would be far less interested in getting tickets, going to games and buying merchandise,” says Finn. But the same link that connects betting and the NFL also makes the gambling industry vulnerable to labor stoppages—of officials and players. Gamblers like to play odds feeling that they are somewhat in control of the outcome and when games become less predictable due to poor officiating, similar to what we saw in the first few weeks of the NFL season, it could reduce people’s interest in betting on the sport. And when NFL games stop, so does the betting. If an NFL lockout were to occur, Finn estimates that the NFL would lose fans and bettors to college football. “It’s the second most popular bet on sport behind NFL football so guys who would originally bet on Sundays would bet on Saturdays,” he says. Fantasy Football is another fan-driven industry that is completely reliant on the proper functioning of the league. According to research from the Fantasy Sports Trade Association, 33 million Americans participate in Fantasy Football and the industry adds about 2 million new players every year. Fantasy football players create rosters of real NFL players and compete against their friends’ teams. As the games are happening in real time they root for their players to perform well and get points for their team based on how each player does. In addition to the social aspect provided by the teams, big money is also involved. Although Charchian is quick to emphasize that the average entry fee to a league is only $70, which divides into about $4 per NFL game, the FSTA found that $1.18 billion changes hands between players through pools each year. The companies that provide the online Fantasy forums like ESPN, Yahoo and CBS Sports don’t take a cut of the winnings or even handle the money that is bet. But they do charge a small fee for the use of their platforms and make sizable income off of advertising, phone apps and insider fantasy football guides. Research provided by Ipsos found that Americans spend an estimated $800 million annually on all fantasy sports media products. Analysts say the platform is one of the biggest marketing agents for the sport. Gambling is a shadow industry that operates independently of the NFL but relies on football games to bankroll casinos and its gamblers. In addition to the larger viewership gleaned from Fantasy fans, the NFL also capitalizes on the industry through its own Fantasy Football league by broadcasting winning Fantasy league scores during games. Like gambling, Fantasy Football is reliant on the smooth functioning of the NFL season. Odd calls can eat into players’ statistics. And if an NFL lockout were to occur there would be no games and therefore no statistics to base Fantasy teams on. Berry says the scenario is something ESPN “spent a lot of time thinking about last year” when there was potential for a full season lockout. He says that he gauged from Fantasy Football fans that they wouldn’t be likely to take a disruption to their season lightly and that some may have moved to college football or other sports.